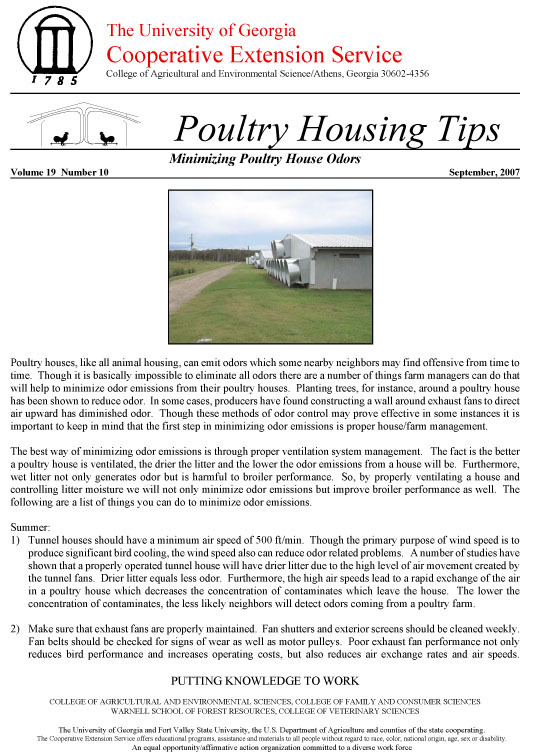 Poultry houses, like all animal housing, can emit odors which some nearby neighbors may find offensive from time to time. Though it is basically impossible to eliminate all odors there are a number of things farm managers can do that will help to minimize odor emissions from their poultry houses. Planting trees, for instance, around a poultry house has been shown to reduce odor. In some cases, producers have found constructing a wall around exhaust fans to direct air upward has diminished odor. Though these methods of odor control may prove effective in some instances it is important to keep in mind that the first step in minimizing odor emissions is proper house/farm management.